Denham Springs' Desiree Jones (35) scored 24 points in the Lady Jackets' 51-44 win Wednesday over Plaquemine. PLAQUEMINE – Denham Springs extended its win streak to 12 games with a 51-44 road victory Wednesday over Plaquemine. The Lady Jackets (18-3) built a 30-17 lead at halftime, extending that margin to 42-23 after three quarters before having to hold off the Lady Devils’ 21-9 surge in the final quarter. 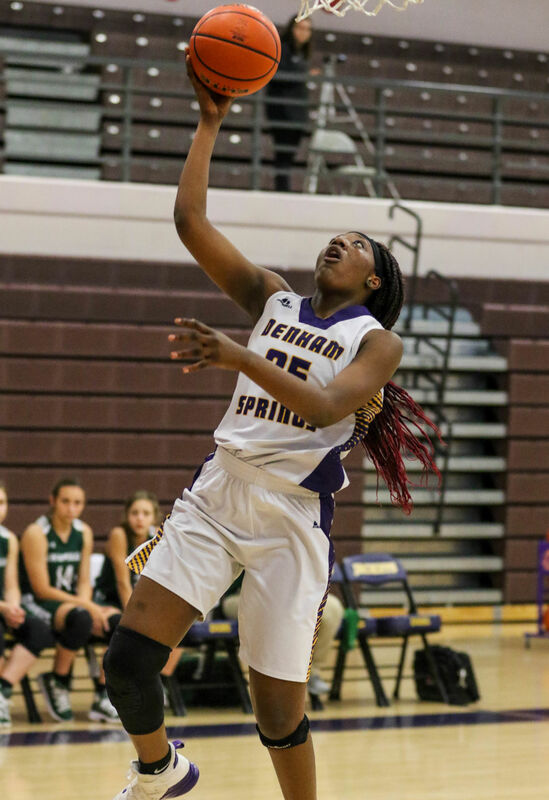 Desiree Jones led Denham Springs with 24 points, scoring 12 of her team’s 18 points in the second quarter. Katherine Thompson added 10 points. NEW ORLEANS – LSU signee Tiara Young scored eight of her game-high 27 points in the fourth quarter and Tarondia Harold added six of her 10 points in the decisive quarter, enabling the Lady Cats to secure a five-point victory. Walker (21-4) trailed 31-29 at halftime and again 47-40 after three quarters when Young and Harold combined to score 14 points that enabled the Lady Cats to go on a 16-4 run to close out the game. SPRINGFIELD – Lori Martin scored all 14 of her team-high points in the second half to help Springfield pull away Monday from East Feliciana. The Bulldogs led 24-9 at halftime and thanks to Martin’s outburst, helped to hold a 27-22 edge over the Lady Tigers in the second half. Johneisha Joseph added 10 points for Springfield.